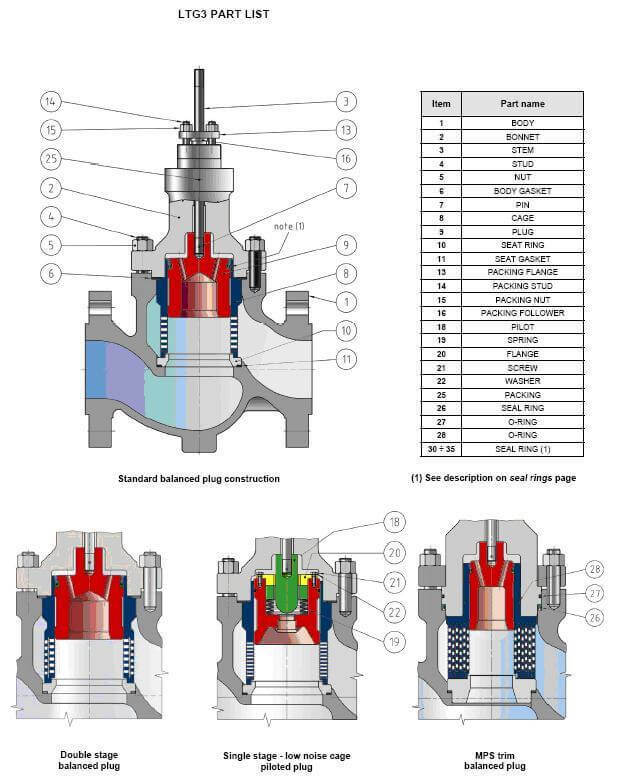 Globe straight-way LTG3 is a very versatile control valve for general applications. Its high performance, coming from using a balanced and cage-guided plug, is particularly suitable for heavy duties and for any other application under most demanding service conditions. Due to their simple construction, to the large range of trim types and material available, these valves are suitable for a wide range of applications, including also high temperature and corrosive fluids, critical low-noise requirements and sour service in accordance with NACE standard. Reduced thrust and actuator size are allowed by the balanced plug construction. MPS multistage trim special design for high pressure drops. Multi-cage constructions up to 6 stages. 7 stages and over are obtained from a solid disk stack. Linear and equal% characteristics for standard trim design.